First National Bank of Bangor operates with their customers in mind. They understand that customers’ banking needs are constantly changing and First National Bank of Bangor works to help meet these expectations. The staff at First National Bank of Bangor and the banks branches value what it means to work in a community. The bank offers a wide selection of banking options including online banking for customer convenience. 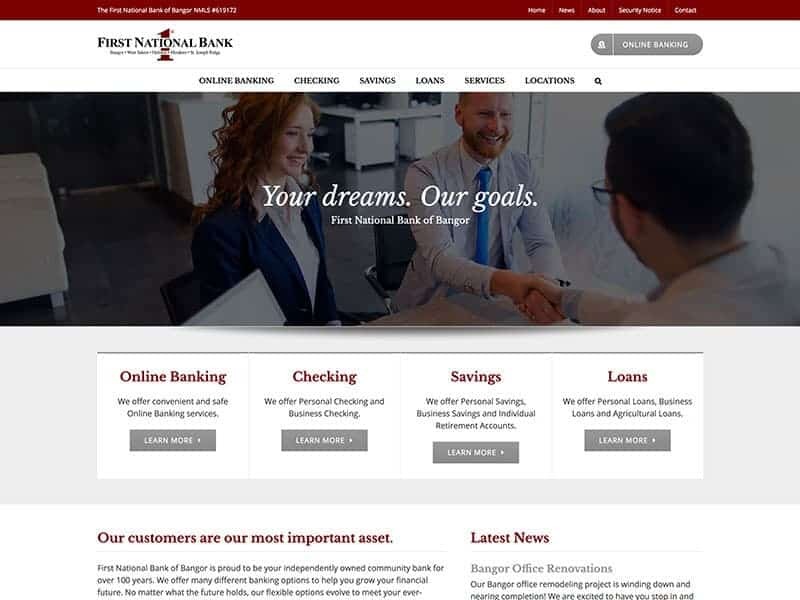 The First National Bank of Bangor old website had a lot of customer traffic and the company wanted to update their site to allow easier access and navigation. To meet the concerns of online banking, our team updated the site to help engage customers to use the online banking capabilities. Because the First National Bank of Bangor has several branches in other communities, we linked each branch website along with individual directions and business hours for customer convenience. Contact forms to help generate leads were updated to be compatible for desktop and mobile users. A great bank website is as important as the staff. Talk to us to learn more!